It was a real pleasure to meet Ethel Williams on her 100th Birthday. Ethel lives at Dovehaven in Southport. Ethel was born in Leigh Lancashire in 1917. During the war she served as a Land girl in Montgomeryshire in central Wales where she met her husband who worked for the Forestry Commission and settled after the war. 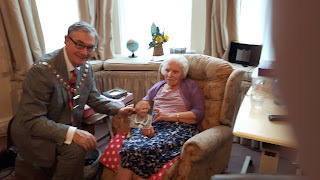 It was great to hear Ethel's memories and to discuss how much things have improved. She spoke of how much difference the automatic washing machine made. Ethel played the organ at the Victoria Methodist church in Blowick.